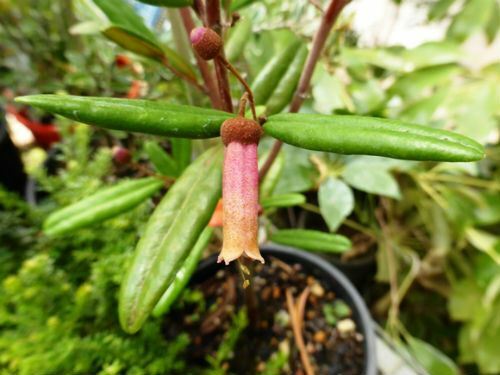 Correa lawrenceana var. rosea is a tall shrub that will reach a height of 3-4 metres. Plants are happy to be pruned and may be kept to a lower, bushier height. Dark green, narrow leaves are up to 60 millimetres long, shiny with a leathery texture above and hairy beneath. Tubular flowers are red, narrow and up to 20 millimetres long. Blooms appear in autumn and winter and help to light up our cold climate garden in these cooler months. The glossy leaves contrast nicely with the long, colourful flowers. We first came across this handsome plant some years ago on a trip to the Snowy Mountains in southern New South Wales. A number of tall shrubs were growing close to the Geehi River. We were attracted by their glossy foliage and on close inspection found the characteristic, tubular red flowers. The type specimen was also collected at this site in 1958 by J. Vickery and named by Paul G. Wilson in 1961. There are about eight varieties of C. lawrenceana. C. lawrenceana var. rosea naturally intergrades with C. lawrenceana var. latrobeana in alpine areas. Propagate from cuttings. In our propagating unit ,C. lawrenceana varieties appear to be slower to produce roots than other correas. For those interested in Correas, we would recommend Correas Australian Plants for Waterwise Gardens by Maria Hitchcock, a life member of APS. This is a splendid publication covering all aspects of the identification, propagation and cultivation of this unique Australian genus.